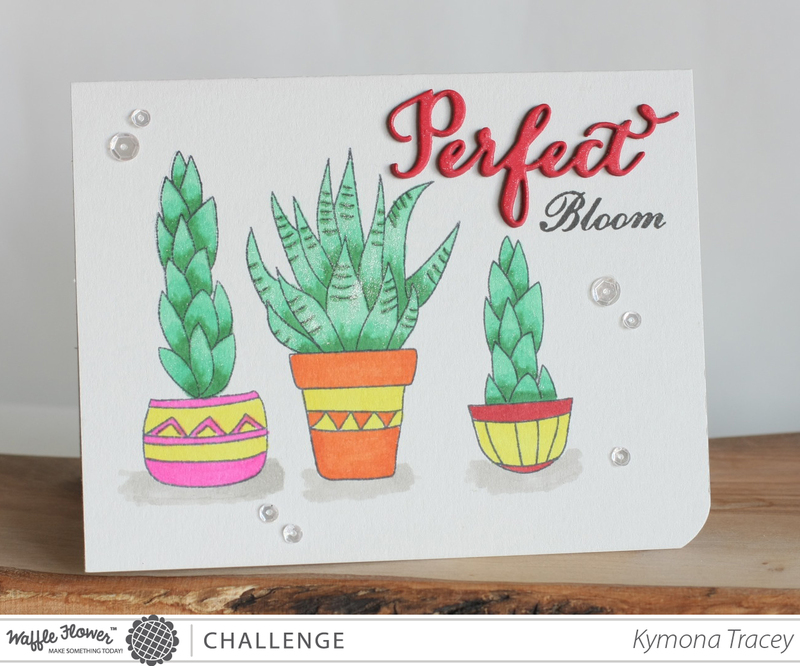 To see the completed card and the process in which this card was create, please stop on by Nicole’s blog Right At Home! Hello everyone!! I’m here today with Waffle Flower’s 2nd Photo Inspiration Challenge!! What did you thing of the first challenge? Those colors were a challenge but not to challenging to some of you! I love seeing all of the entries. Sooo, what do you think? I totally love this new Planted Stamp Set and the Perfect Word Die from Waffle Flower. If you know the stamp set, that third potted plant was created using the plant from the first stamp! Ingenious, is what I say, LOL!! 1. I cut my Simon Says Stamp Fog cardstock to an A2 (4.25 x 5.50) size card. 2. I stamped the first and second potted plant using Memento Tuxedo Black ink because I wanted to color the images using my Copic markers. 3. I used my Copic markers to color in each plant and pot. I used the same colors in the photo. 4. For the third potted plant, I stamped the empty post first. 5. Then I created a mask for that pot, so that I could stamp the plant inside. Then I colored the image. 6. I die cut the word Perfect out of Simon Says Stamp School House Red cardstock 4 times..
7. I stacked them on top of each other so that the die could have some dimension. I adhered the die to the front of my card. 8. I stamped the word “Bloom ” underneath the die cut. 9. I added some Pretty Pink Posh sequins to the card and that was it. Super easy card to create. This card allowed me to practice my Copic coloring. Come on and join us!! Now I can’t wait to see what you come up with.